When we drove to Portland last weekend I needed some car knitting. I get motion sick and can't read charts or look closely at my knitting while in the car. It was a perfect excuse to start Metro from the latest Twist Collective. I chose Malabrigo Twist in Teal Feather and it is luscious. So fluffy soft and lovely to knit. Now it lives on the sofa by the TV. 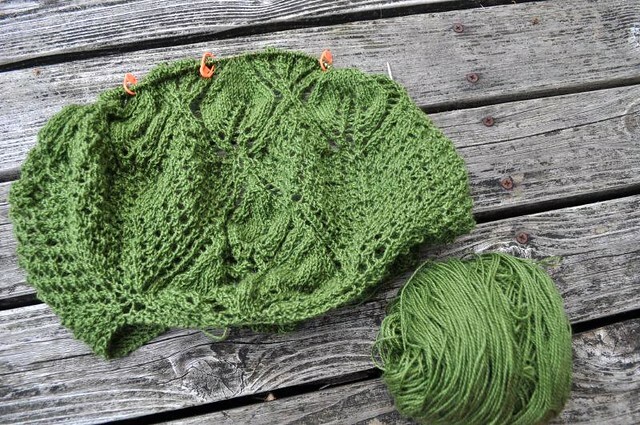 I've been making slow progress on my 22 Leaves Shawlette. This one lives by my computer so I've been knitting it while finishing last season's Dexter. This is going to be a very small shawlette. The suggested needle sizes were 4-6. I chose 4 because I didn't want to run out of yarn as has been the hallmark of most of my shawl knitting this year. I needed some movie theater knitting this weekend. 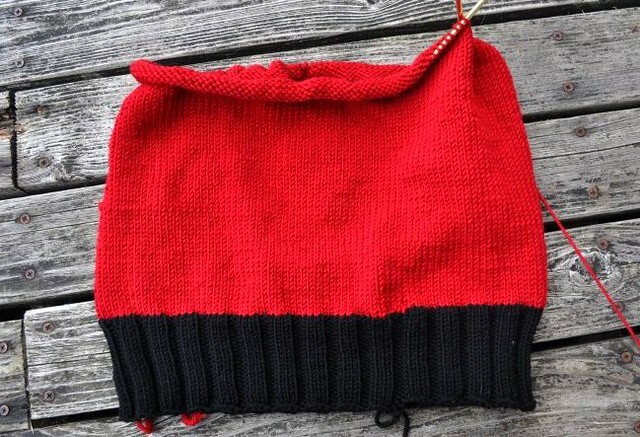 My younger son has been asking for a new sweater so I took him to the Fiber Gallery and he picked out this red and black in Debbie Bliss Rialto Aran. I did a crochet provisional cast on just before heading to the theater and was able to knit the stockinette at the show. After I finished my first skein of red, and was home where there are lights, I undid the provisional cast on and knit the ribbing in the opposite direction. Knitting a 33" sweater in worsted weight yarn is so fast! No wonder all those petite people on Ravlery keep knocking out sweaters in a week. I'm petite, but dithery indecision usually keeps me from producing anything quickly. Still, I know it would only be worse if my garments had to be larger. 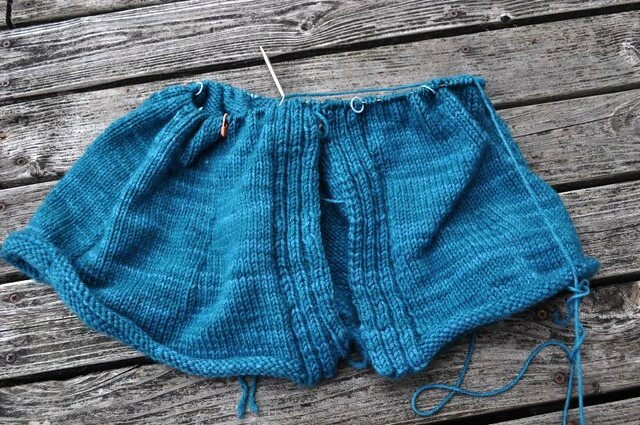 I've knitted sweaters and now socks for my bf and noticed how much longer it takes to crank out that acreage. Love that teal Malabrigo. Turquoise tones are really calling to me lately-- maybe I'll "knock out" (heh-heh) a pair of socks in turq.